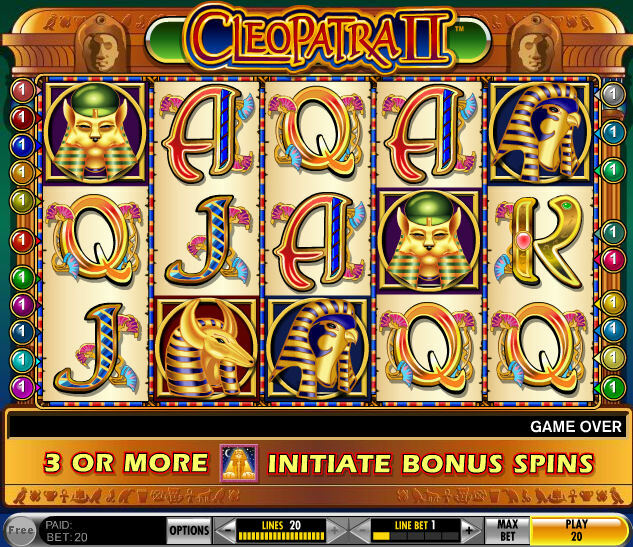 Cleopatra II Slots is a hybrid of its sister slot machine Cleopatra Slots. It takes all the basics of the game, including the exact same symbols and just makes it more extreme. Your chances of getting the bonus game are a lot better in this one than the other Cleopatra game ( I got it within 3 spins) because there are more bonus game trigger symbols and even the graphics are better in this one. What seems to be missing from this slot machine is consistency. Yes you can go on a crazy hot streak and win a lot of money fast, but going through long droughts is also very possible. The wild symbol for this game is a graphic Cleopatra with “Cleopatra II” stamped over it. One or more Cleopatra II symbols completing a line win doubles the award value, except when the line win only consists of Cleopatra II symbols. You will find a lot more of these in this slot machine than in the other Cleopatra game. The scatter symbol is the sphinx in this game. The bonus game is very lucrative in this one. A lot more lucrative then its sister slot. Three sphinx symbols trigger the bonus game. When you get them, you are taken to a screen that has three “royal” boxes showing and you choose one to see how many free spins you get. You start with a 1x award multiplier with your first free spin and this multiplier grows by 1 for each subsequent spin, up to a maximum of a 50x multiplier. If you get another three sphinxes during your bonus play then you earn additional free spins equal to the number initially awarded, up to a maximum of 50. And your multiplier will keep growing and growing all the way. This slot machine can be very rewarding. Like I said, I got the bonus game on the third spin so you won’t have to wait for forever to start playing the game and the game is also very entertaining. I recommend this slot machine to everybody.